She even tried to cut it's hair but lucky was stopped. This makes me so cross and very upset, how can people treat innocent little beings like this, goodness knows what his fate will be. Way I am feelin now is to march down there and bang the breeder and girls heads together. I am so annoyed I don't know what to say. How on earth can any responsible adult do such a stupid disgusting thing is totally beyond me. What I want to do to both the breeder and the idiot of a 17 year old is not decent to be written on a public forum, but I think everyone can imagine what I am thinking. This is wrong on so many levels. Well he cries all night long so good know what she is doin wih him clearly not crate training or supporting his needs will end up with a problem if they carry on. I said would go tomoz to have look at him to see if he is in pain ( told to go vets) also to see if I can talk to adult about his future I feel if I stick my nose in to muh they may put the breaks on. They only spoke to me because I have a shih tzu thank god it was me not any other random with a shih tzu. Low life's like that want to make a profit...makes me sick. They should be made to pay someone 500 to take him instead of the other way round. Poor baby, breaks my heart.....if only they would just donate. So it's either sell or he will be given to aunt who knows poor lil lamb has been buffered around and is having separation issues already tolieting all the time mostly threw fear and just pup. Poor puppy, honestly what is wrong with people. 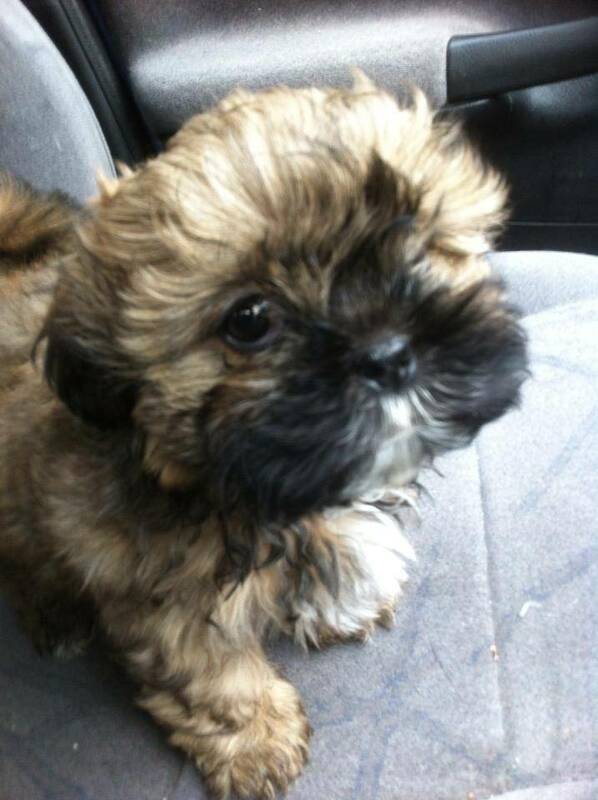 Surely when you buy a shih tzu you know they are going to require more maintenance than a short haired dog. As for how it's being kept, well he is obviously not being cared for properly and being so young and vulnerable it makes you feel very sad. I knew very little about shih tzu's when we got Daisy and it was a steep learning curve but you do get there eventually! That is the most appalling thing I have heard of.That puppy looks scared. He so gorgeous.There is no way anyone will pay £500 for him. This is just why you see this message on the backs of cars and the like 'A dog is for life not just for Christmas' how does a 17 year old have a spare £500 to buy a puppy. The breeder can have no scruples if the allow one of their pups to be sold to a 17 year old. They obviously just saw the £ signs without any care for the puppy's welfare. Absolutely dreadful. The aunt went mental and took him to a foster because poor lad was just not been looked after. Foster has no idea about the breed so guided her in some care being nice nice to keep it all calm. But the eyes were gunk up they was about to cut hair with kitchen sissors this is what we r dealing with ere. Sorted eye at least so comfy. Mouth and nose just think he is young and kibble to dry so said as emergency nature diet puppy to get some energy into him.... Not sure I am going the right thing but he is in the hands of fools and he is clearly not doing well.... He seem playful but may have worms told them to worm him and have them drontol pup syrup stuff. For some reason they bathed him in shower gel so he is alil itchy no fleas. Could have just took him there and then.... Keep my cool was hard. I wouldn't say RSPCA needs to be informed think the pup needs some food as dry bakers is not working he has been put to a friend who has items for the dog aka bed toys food water bowls.... Think the idea of selling on has sunk in and when he is not 100 % is cruel. Told them no more bathing and spraying smelly stuff... I will call about the milk good idea. So told them to at least leave him in safe space so he can't roam and get lost. I will call tomoz but I think they r a lil lost not being cruel. Think the pup is scared also carry him around so he did not pee which may be a reason for a full belly he is in a massive open plan flat with his water and food at one end miles away so is a lil lost.... He is so sweet and just sat on my lap nibbling my fingers and looking at me with them big brown eyes. Had a message he has been crying whimpering night long... Said he has been moved around a lot and lost also has he ate maybe hungry. They brought butchers puppy and gravy something like that. Said this was to rich so in the price range wet from said maybe James w b pup but works out cheaper nature diet because it's a bigger tray. If they r going to buy butchers at least get the non gravy pate version.... And not put te whole tin in the bowl and leave out all night long... Jesus !!!! I have have them royal canin shih tzu 28 pup dry but seems like they r not using that.... But pointless me giving them food when they can't afford to maintain it.... Low budget wise what can I suggest as it's all poo but what's less poo ? Has he actually been weaned by the breeder? I am sorry Liz but you SHOULD contact rspca. They need official help by official I mean somebody who can enforce the correct care of the puppy (which btw is law) otherwise there is going to be a dead puppy there. He is eattin has water and shelter there is nothing RSPCA will do he has been drinking a lil goats milk. They will not come out they just need help in the right direction foster friend is listening to me his poo and wee is fine.